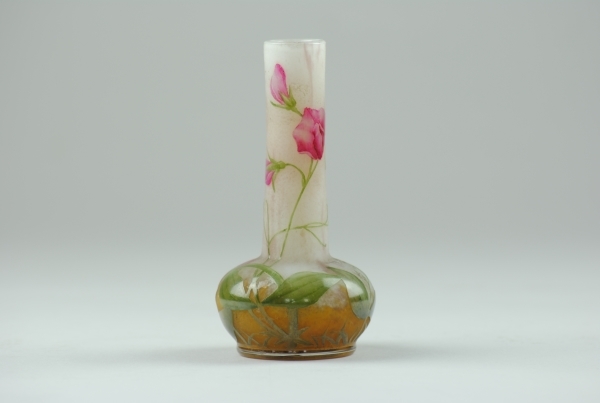 A beautiful Art Nouveau Daum glass vase decorated with cameo and enamel with a design of finely detailed sweet pea flowers and leaves. 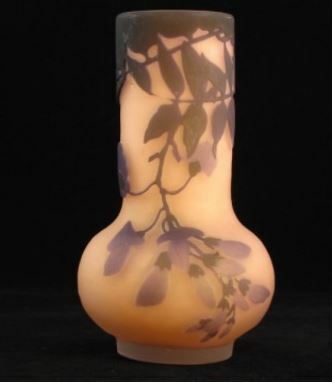 The body of this delightful vase has the acid etching executed on a clear frosted body with intercalaire amber glass suffusing to dappled white. 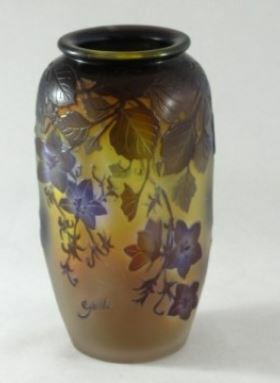 The coloured enamels are semi transparent and would be at least 3 layers. Signed in cameo Daum Nancy and with the cross of Lorraine. Made in France c 1905. 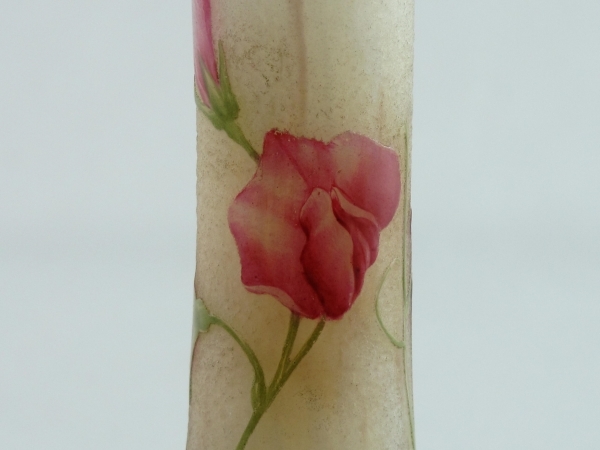 The bulbous base and long slender neck complement this design and it would make an excellent addition to any collection. 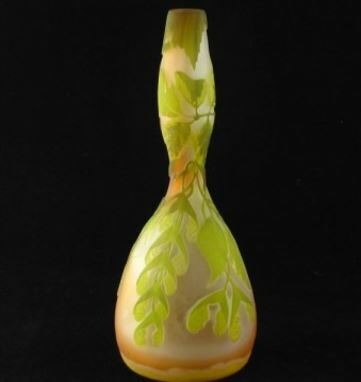 The Daum Glassworks was established in Nancy, France in 1875 and is still making glass today albeit of a very different style. The family were originally Lawyers not glassmakers. Jean Daum the father of Antonin and Auguste originally took over the glassworks as part payment of a debt. Auguste (also a lawyer) joined his Father shortly afterwards and started to develop and expand the business. Auguste and Antonin and later Michel were the main family members involved in the major development of the Company. The Company employed major designers including Jacques Gruber, Amalric Walter, Henri Bergé, and in more recent times Philippe Stark and Salvador Dali. 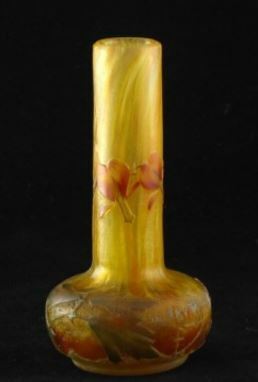 They developed and patented many techniques in glassmaking and were always at the forefront of design and manufacturing. 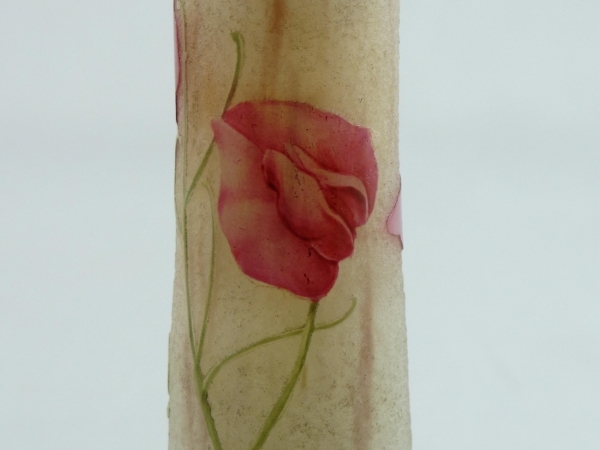 In 1900 at the Exposition Universelle they were awarded a Grand Prix medal and quickly became one of the major makers in the Art Nouveau movement. 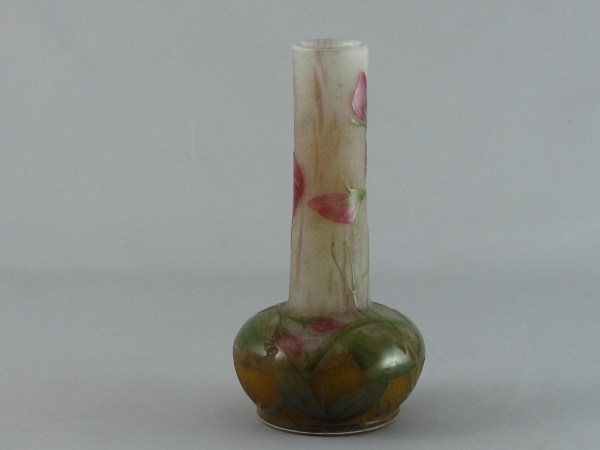 After the First World War styles began to change and the simpler bolder designs of Art Deco became fashionable. 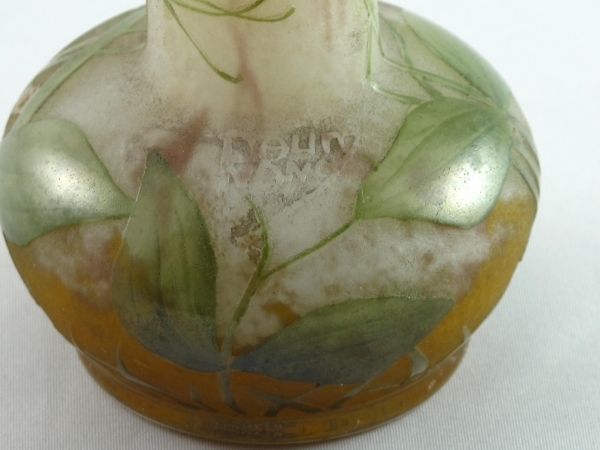 Daum excelled in this period and led by Paul Daum developed new techniques that used thicker single coloured glass but very deeply acid etched with alternating polishing.